I finally realized I could make these pictures bigger! Sorry for the tiny ones from the past. 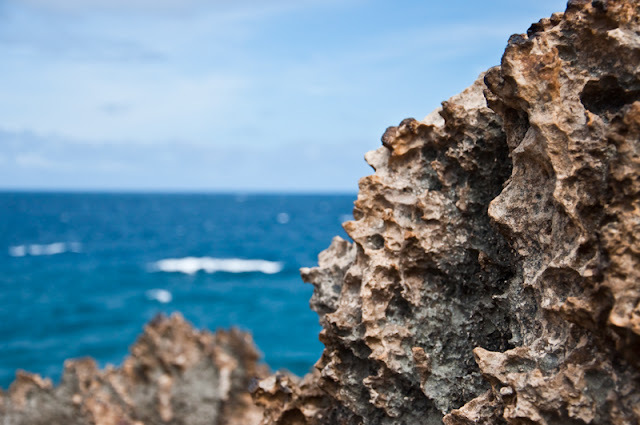 This panoramic shot at Maha`ulepu Beach was taken with Dan's wide angle lens, the actual image is 50x20 inches. It took 9 shots stitched together to get it. Now I understand why it's so hard to capture the immense beauty when your an amateur! Happy Father's day to my wonderful and loving father! I'm so glad you're my papa and appreciate the gifts you have given me, especially the gift of the love of nature. Some kids contemplating jumping off Kipu Falls, the one in the yellow shirt finally did. 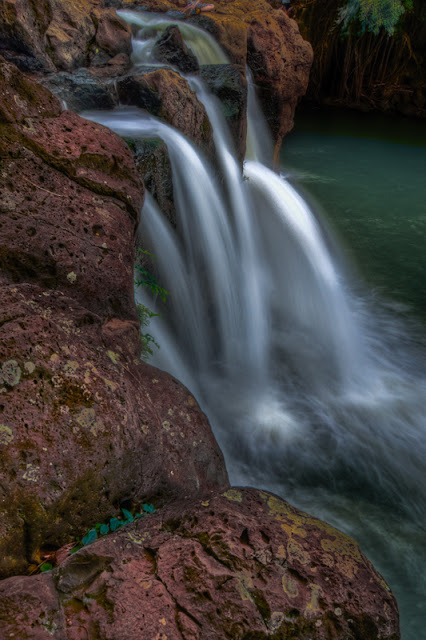 The other one sat there dipping his hand in the spring water and looking below. Dan just finished his first week at the photo tour company. It went great, it’s almost like he’s been doing it for years. He has become fast friends with the other two tour guides, both half his age. The owners were pleased that he got back to the shop on time, most first timers come in an hour to two hours late. He’s enjoying showing people around, teaching them how to get a shot, grabbing shots himself, and being out on the island. He did two EZ Tours, where you get out, take some shots, and get back in the van. hitting an average of 12 locations. He also did two hiking tours which involves some steep terrain, hitting about 7 locations. He figures he hikes up hill for about 4 miles when it’s all said and done, and then, of course the 4 miles downhill. All with a 50 pound backpack. He’s been a little tired, a little sore, but he expects to be in tip top shape soon. He’s been an avid hiker for longer than I’ve known him, so it feels good for him to hike again. 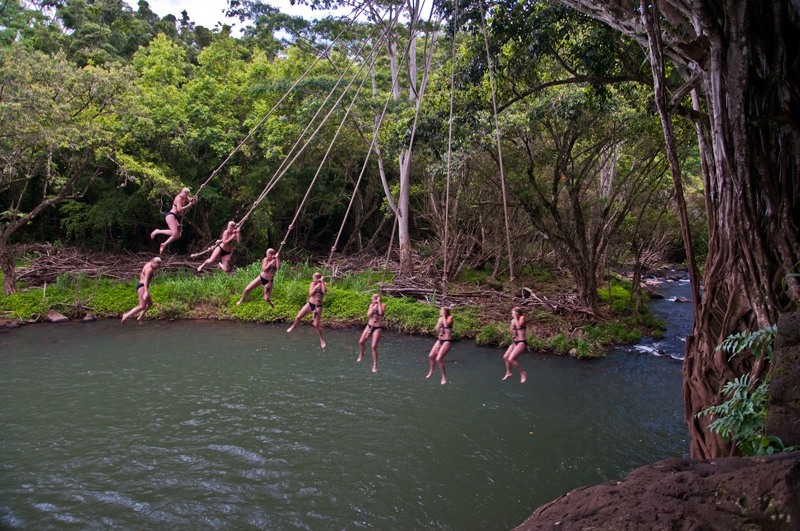 Rope swing at Kipu Falls. Dan composited the shots so you can see the whole trajectory. He told me he’s the happiest he’s been since moving here and it shows! Everyday he comes home full of energy, good will and happiness. After he animatedly tells me about his day, he gets to work. He checks out all the shots he took and starts making the choice ones pretty for his blog. Monday after work, Dan met me at a gluten-free bakery for my Tastes of Kauai column. We spent about an hour and a half there before he got to come home. As I made dinner, he processed photos and wrote up his blog. Wednesday after work, he pulled his moped into the garage where I was waiting. Rinsed off his feet and off we left to interview a farmer on the North shore. We were supposed to go to a “green drinks” social mixer, up north a little further, but we were running about an hour late so we stopped for a sunset shot instead. He took me down a steep incline that they do on the hiking tours. A beautiful spot with a view of Hanalei Bay, I never noticed before! He’s been busy, but loving it! Meanwhile, I have been going stir crazy. Being a full time writer means I spend a lot of time alone, at home. Dan came to my rescue and took me to some places he does for the tour. They were on the South shore because it looked like rain up north. Dan processed these shots from the day for me to post here. The beautiful, lacy lava is as sharp as glass! 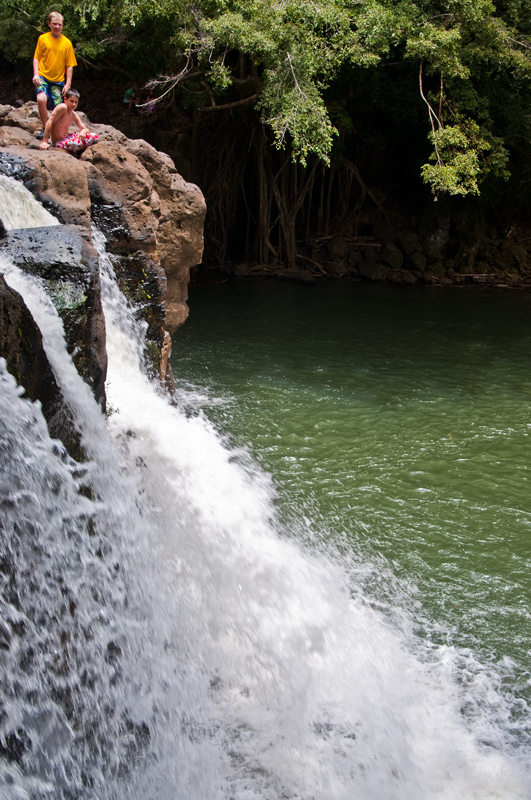 First, we went to Kipu Falls and while he took shots, I wrote about it for the travel agency. It’s so nice to be able to spend they day together “working”, and doing the things we like while seeing the island. Folks were jumping off the 30 foot fall into the pool below. Men, women, children, even grandpas! 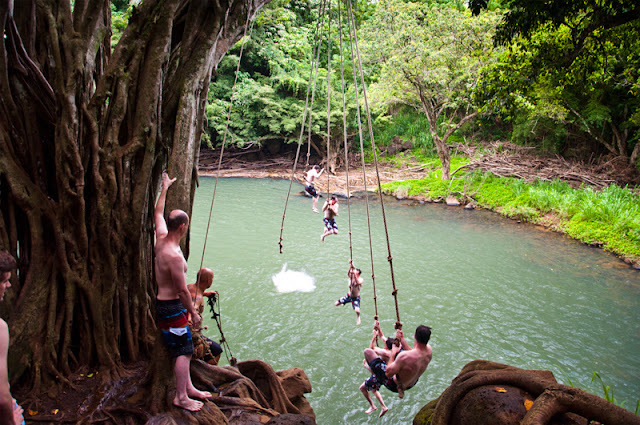 There was also a rope for people to swing out on. I asked Dan to pretend like I was a client and show me how to get a technically correct shot of this exploded lava bubble. They were everywhere. I wish I could dig one out, take it home and use it as a planter! 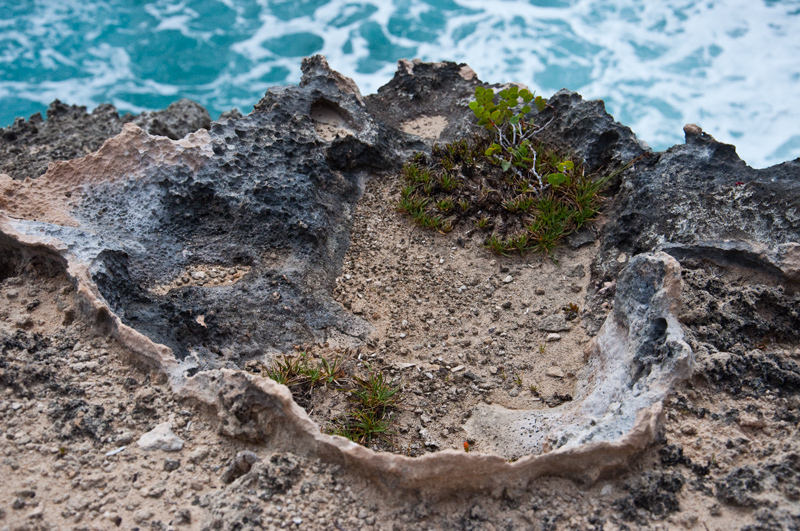 Standing on the edge of a sandy trail looking 20 feet below. 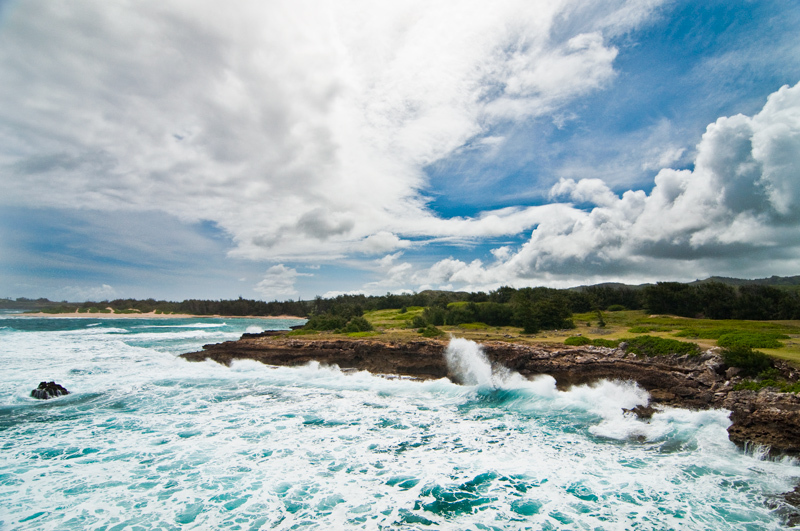 Then we went to Maha`ulepu Beach. 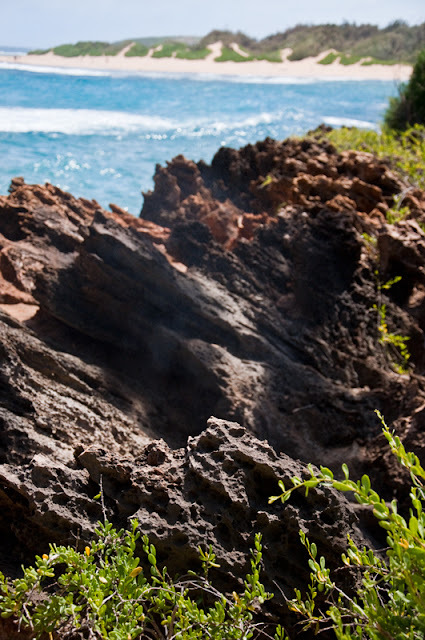 It looks like an alien world with jagged, lava cliffs and blow holes. The South shore is dryer than the North, so it reminded me of the Mediterranean. Plus, in the summer, the swells are bigger on the South shores. Huge waves crashed on 40 foot sea cliffs, pounding out the underneath so they arched. 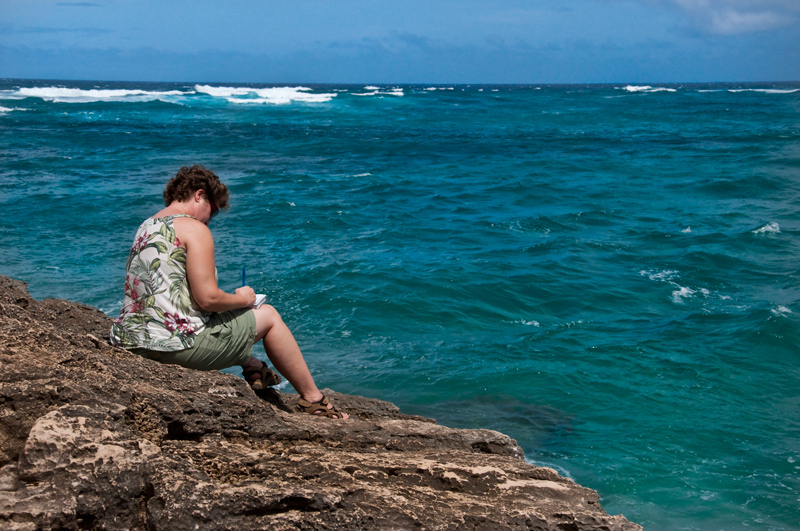 The waves sent sprays higher than the cliff, which we were on, looking down into the ocean. 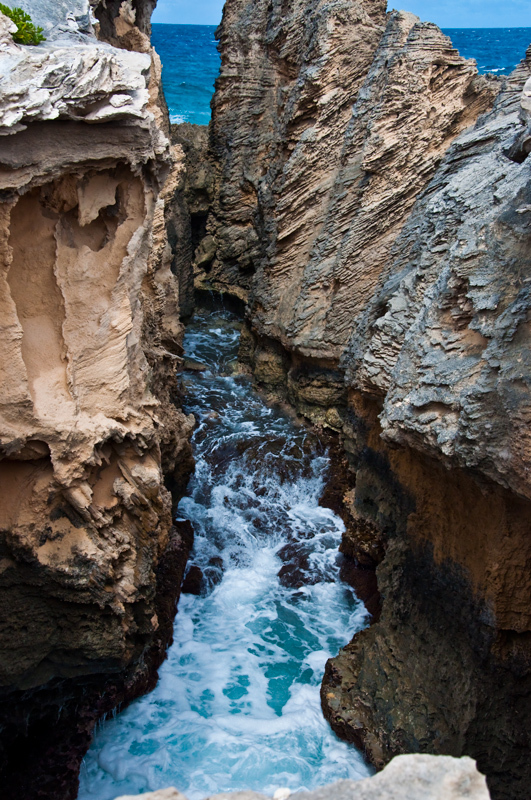 We were walking on top of those etched out cliffs, and huge currents of air, booming sound and misty sprays came from the blowhole beneath our feet. It felt like I was in Yellowstone, like I was on primitive planet. 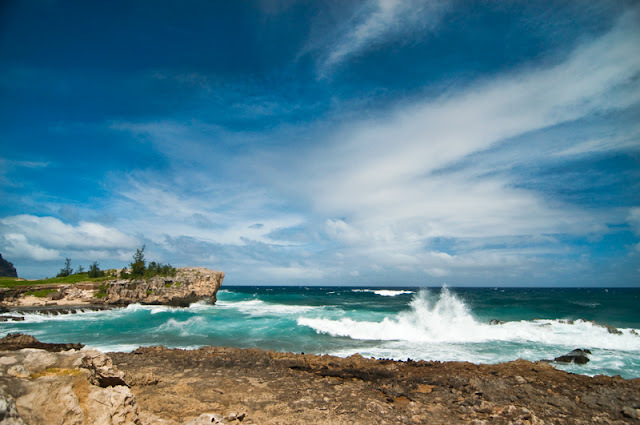 This is one of the cooler looking blow holes. There is a slight fog in the center, that's because of the mist from the ocean below, so cool! It was an amazing day and I felt revitalized, and happy to be reminded of why we moved here and happy to have a husband who not only knows how to get me out of a funk, but knows some killer places to take me! Dan is so stealthy, I didn't even realize he got this shot of me! Of course I was completely absorbed in the beauty, sound and the joy of writing about the place. Aloha! I’m off to the laundry mat.